Dr. Sparano and his team of aestheticians perform superficial and medium-depth peels in an office-based setting. These peels have no downtime, or minimal associated downtime, depending upon the treatment selected. For deeper indicated skin treatments, Dr. Sparano prefers the predictability of deep laser skin resurfacing over deep chemical peels. Dr. Sparano uses only PCA SKIN products for chemical peels, corrective serum application, revitalizing masks, cleansing treatments, and facials. PCA SKIN has remained a trusted industry leader in the development of gentle, yet highly effective professional treatments for over two decades. PCA SKIN is a unique company dedicated to serving patients and maximizing successful outcomes. The company partners with physicians to educate on the science of healthy, beautiful skin. PCA SKIN has been acknowledged in prominent medical textbooks as the originator of advanced blended chemical peel formulations. PCA SKIN chemical peels are available exclusively through licensed skin health professionals that have been trained and certified by PCA SKIN in their use. PCA SKIN certification is sought after by medical professionals across the nation. Dr. Sparano offers 3 primary chemical peel types. These have been award-winning peel formulations, very well-established and well-studied. They are safe and effective. 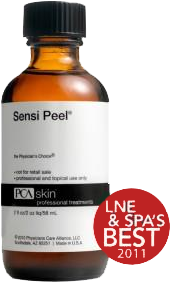 The Sensi Peel® is formulated as a unique peeling option for all patients including those with highly sensitive skin. This gentle 6% TCA solution will improve surface texture and brighten the skin while helping to promote an even skin tone. This multi-faceted and skin-brightening treatment is an excellent option for sensitive skin and all skin types. It will strengthen and brighten the skin while helping to treat sun damage and other forms of hyperpigmentation. This multi-faceted treatment also provides anti-inflammatory, anti-acne and antibacterial action, making it an excellent choice for helping to calm rosacea, as redness and inflammation can subside substantially after treatment. 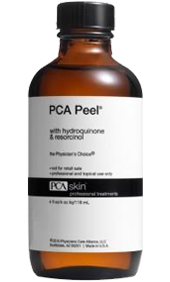 The PCA Peel® with Hydroquinone & Resorcinol is a potent enhanced Jessner's peel, designed to help improve the appearance of skin tone and provide exfoliation for oilier, thicker and more resilient skin types. It is extremely effective on sun-damaged and thickened skin. It is also excellent for those with active or cystic acne and asphyxiated skin (i.e., dry on the surface, oily underneath). It is also effective for those who require deeper treatment. This treatment, only administered by Dr. Sparano, is a deeper, more active peel for patients with resilient skin and more dramatic wrinkling, sun damage, or acne scarring. 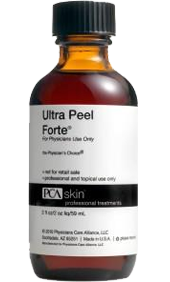 This peel will effectively treat aging skin, acne, pigment disorders, smokers’ skin, and photo-damaged skin. This is an ideal treatment for aging skin in need of rejuvenation. All peels include a post-treatment kit and a choice of 3 corrective serums with an optional Esthetique Peel Booster. The selected serums and frequency of peels are customized to each patient’s skin type and ultimate treatment goals. The treatment plan is established during a private complimentary consultation with Dr. Sparano or one of his partnering aestheticians. The staff at Sparano Face and Nasal Institute takes skin science very seriously, and prioritize the value of education and careful treatment selection when determining any treatment plan. Chemical peels are a cost-effective way to rejuvenate facial skin. Call us to schedule a free consultation and customize a treatment for you.